The station is located on Talad Mai road, Soi 19, Seatran Coach Bus Terminal. It provides passengers with a minivan/bus transfers operating all day between Surat Thani Town and Seatran Donsak Pier. 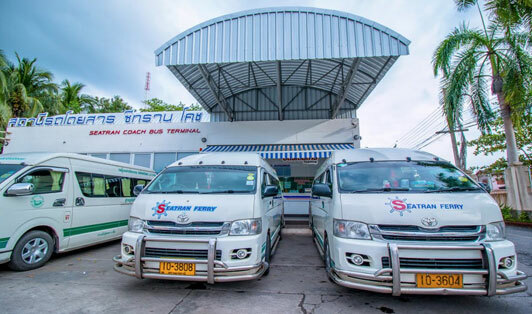 Seatran Discovery provides just 2 bus departure times to match their ferry schedule to Koh Phangan, Koh Samui, and Koh Tao, the first is at 9:30 am and the second at 12:30 pm. Once everyone is collected, we will start the bus trip which will take about 70 minutes. When the bus reaches the pier, the operational staff will direct you to your ferry boat. It's a smooth and simple process. Don’t forget to print out your e-ticket, and hand it to the staff when requested.